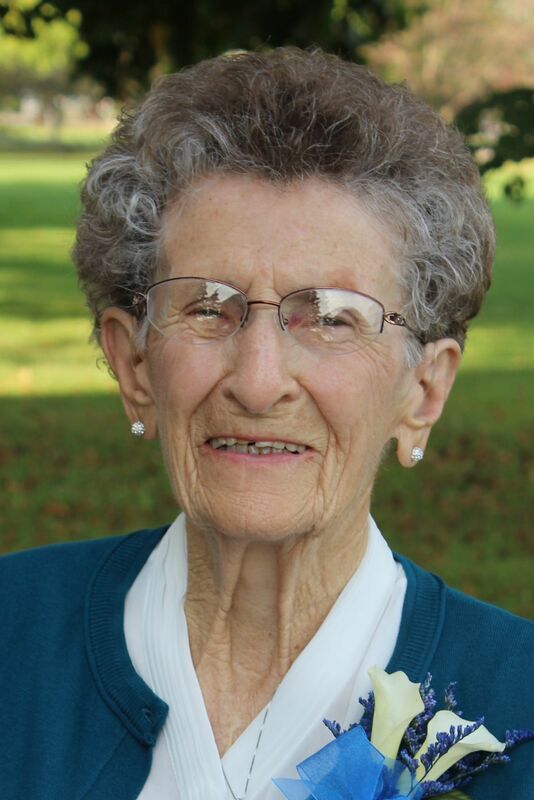 Virginia “Gini” Dolores Wermund, 91, of Chippewa Falls died peacefully at the Chippewa Manor Nursing Home and Rehabilitation Wednesday, Feb. 6, 2019, surrounded by her family, and under the care and comfort of St. Joseph’s Hospice. Virginia was born in Chippewa Falls Sept. 25, 1927, the third of 15 children born to Christine (Swoboda) and Henry Schemenauer. While growing up, Virginia attended Hillside country school through the eighth grade. At age 15, she moved to town to work at the St. Joseph Hospital, and then later at the Chippewa Woolen Mill, where she met her future husband, Warren A. “Wormy” Wermund. They were married Nov. 4, 1947, at St. Charles Borromeo Catholic Church in Chippewa Falls, and celebrated more than 63 years together prior to Warren’s death Dec. 7, 2010. Virginia was always very proud of her family and treasured the time they would spend together. Those who are celebrating her life, as well as cherishing her memory, are her six children, 10 grandchildren, four great-grandchildren, and two great-great-grandchildren, Lyle (Sue) of Darien, Wis.; and his children, Brian of Oregon and daughter, Simone; Tanya and children, Whitney (fiancé Nicholas Sylke) and their children, Bruce and Jason, and Darren Comer of California; Jennifer (Andy) Lehr of Iowa; and Danielle, of California; Ann (Clark) Loeffel of Kronenwetter, Wis., and their daughter, Gina (Ritik) Singh, of North Carolina; Dave of Chippewa Falls; Steve (Marcie) of Kronenwetter, and their children, Emily (fiancé Adam Ludwig), of Eau Claire, and Addy (Brady Gregurich) of Minnesota; Mary (Jerry) Jacobson of Chippewa Falls, and their children, Todd (Mary) of Arizona and daughter, Teresa, and Beth (Jacob) Leahy of Chippewa Falls; and Jane (Jim) Ford and their son, Jaren, of Georgia. She is further survived by siblings, Patricia Bohl, Elizabeth Bowe, Carol (Steve) Bohl, all of Chippewa Falls; Henry (Evelyn), Richard (Diane), Charles, and Daniel Schemenauer, all of Chippewa Falls; and sisters-in-law, Rose and Edna Schemenauer, and Betty Bohl of Chippewa Falls. Additionally, Virginia is survived by a “special niece,” Grace Ann (Jan) Van Dreser, and many other nieces and nephews, treasured friends, relatives, and neighbors. In addition to her parents; and her husband; Virginia was predeceased in death by her great-granddaughter, Aria Wermund; her mother and father-in-law, Einar and Gena (Haugen) Wermund; twin brothers, Francis and Frederick in infancy; brothers, Gerald, Kenneth, Francis “Pretzel”, Greg and Thomas Schemenauer; brothers-in-law, Bob Bohl, Wally Bowe, William Waege and Lloyd Wermund; and sisters-in-law, Karen, Pat and Dolores Schemenauer, Eleanor Waege, and Florence Wermund. Virginia’s life will be celebrated with a Mass of Christian Burial at 10:30 a.m. Saturday, Feb. 16, at St. Charles Borromeo Catholic Church, 810 Pearl St., Chippewa Falls, with Msgr. Michael Gorman and Fr. William Felix concelebrating. Burial will be in Calvary Cemetery, Chippewa Falls. A rosary will be recited at 4 p.m. Friday, Feb. 15, at Pederson-Volker Funeral Chapel, 44 E. Columbia St., Chippewa Falls. Visitation will follow until 8 p.m. with a Vigil Service at 7:30 p.m. Family and friends may also call from 9:30 to 10:15 a.m. Saturday at Pederson-Volker Funeral Chapel. Pederson-Volker Funeral Home, 44 E. Columbia St., Chippewa Falls, is assisting the family with arrangements. Condolences may be expressed online at pedersonvolker.com.